Beautiful engraved RARE specimen certificate from PeoplePC, Inc. dated in 2000. This historic document was printed by United States Bank Note Company and has an ornate border around it with a vignette of the company name and logo. This item has the printed signatures of the Company's President and Secretary. 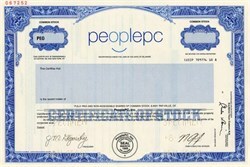 PeoplePC began by giving PCs away for "free" with the purchase of a multi-year membership to its Internet access service. In 2004, the company changed tacks and began to focus on providing straightforward ISP service. It has dropped the PCs and now provides value-priced, narrowband Internet access to more than 1 million subscribers as a subsidiary of Internet service provider EarthLink. PeoplePC also offers a fee-based acceleration service to augment its dial-up speeds and a fee-based spam blocking service.